THE WORLD OF BEES, The bee's world is vast: it is one in which there is flowering, swarming, biodiversity, pollination and a very interesting insect. The bee's world is vast: it is one in which there is flowering, swarming, biodiversity, pollination and a very interesting insect. We could speak only of beekeeping topics, of wonderful stories from our French regions, of the way our beekeepers harvest honey and live in harmony with their hives. Unfortunately, it's also a world in which we have to talk about pesticides, Varroa, the changing climate and the collapse of colonies. That's a world we won't talk about much here. If you want to hear all of these wonderful stories, stories told by people with a passion, touching stories...and if you want to discuss what is at stake for our bees, don't go to a website. Grab your coat, your partner's and your children's hands and go out. 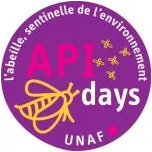 Go meet beekeepers at your local market, in their honey house or at a national event like Apidays. They will best be able to share their passion with you and help you pass it on to future generations. The ingredients we select with care to ensure better synergies between the active ingredients.